Does chicken soup really help you feel better when you have a cold? Generations of mothers and grandmothers swear that homemade chicken soup can cure a cold. Other experts aren’t so sure so the jury is still out. Even if chicken soup isn’t a cold remedy, it’s still a nutritious and delicious way to help you feel better. Does chicken soup cure a cold? Did you know that chicken soup has been prescribed since the 12th century as a way to fight off illness? Jewish philosopher and doctor Maimonides used chicken soup to treat a variety of ailments besides the common cold, but he highly recommended it for colds and other respiratory illnesses. Chicken soup is commonly called “Jewish penicillin” because it has been used so often to treat colds. Before this question can be answered, let’s look at what goes into a pot of homemade chicken soup. Recipes will vary but most chicken soup recipes will consist of ingredients such as chicken, carrots, onions, garlic, egg noodles and seasoning in chicken broth. If we look only at the items on the above list, we see that chicken supplies the body with zinc, carrots provide beta-carotene, onions and garlic are considered to be strong antivirals and egg noodles provide selenium. Each of these ingredients has medicinal qualities which, when combined, may provide the body with nutrients it needs to help fight off the common cold. *Source below. Soup is mainly liquid so it can help prevent dehydration often associated with illness. The ingredients in the broth have been shown to have anti-inflammatory properties which can soothe a sore throat and help inhibit mucus production. Steam from the soup loosens the congestion in your chest as well as loosening the mucus in the nose. Homemade chicken soup doesn’t cause anyone to get overly sleepy the way over-the-counter medicine can. It provides the body with much-needed nourishment when the body is in a weakened state. So, it would seem that homemade chicken soup does provide some health benefits but the medical community isn’t ready to start giving people prescriptions for it. One thing is for sure, even if it doesn’t cure a common cold it sure tastes much better than traditional medicines which means no one will object to taking it. Why not try the fast and easy recipe below? Bring the water to a boil in a large pot. Add the cubed chicken and remaining ingredients and simmer for about 10 minutes until vegetable are tender and pasta is cooked. Add some extra black pepper as it can also help relieve congestion and fever! 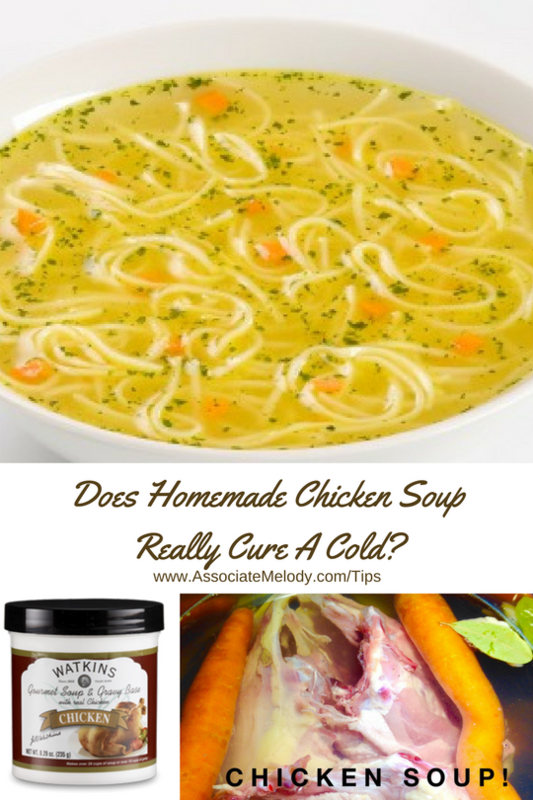 Is chicken soup a cold remedy? There doesn’t seem to be a definitive answer but it appears to help on some level. Do you eat chicken soup to make you feel better when you have a cold? You can find Watkins pepper and chicken soup base here. 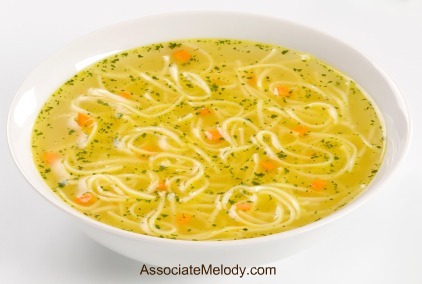 *Source: University of Nebraska Medical Center news release, Research hints that chicken soup cold remedy may have scientific validity in reducing cold symptoms. I’m not a Doctor so I need to include this disclaimer, The Federal Food, Drug, and Cosmetic Act requires the following statement: These statements have not been evaluated by the Food and drug Administration. This product is not intended to diagnose, treat, cure, or prevent any disease. If you enjoyed this information or know someone else who would find it helpful please feel free to share it!